Functional yet decorative, the Bluebell Mirror has a unique pentagon shape. The combination of striking diamond lattice, reflective mirror and unique pentagon shape, the Bluebell Mirror will bing a decorative touch to any exterior wall or outbuilding. Ideal for bringing extra light into smaller gardens or patio spaces, the Bluebell Mirror is functional yet decorative. 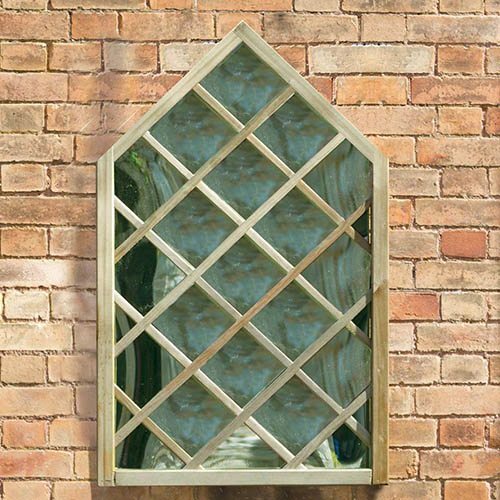 The rustic wooden lattice design is in keeping with a natural garden appearence but it will enhance any exterior wall or outbuilding. The reflective acrylic mirror reflects the sunlight to open up smaller spaces and darker areas and as the timber has been pressure treated you can leave attached to a wall all year-long, whatever the weather.